Tonight, after multiple glasses of wine, I attempted to ease off to sleep by lying down on my bed, turning the lights off and quietly plucking my guitar. As I did so, I found myself playing the opening of Ronan Keating’s cover of When You Say Nothing At All. And with that very familiar opening riff, I found myself transported back through time. That riff reminded me of the times I played it during drama rehearsals after school, with a distinct and beautiful winter sunset striking the sporting ovals of Padua College, St. Anthony’s or Mount Alvernia. It conjured up memories of seeing movies like Notting Hill at the now-closed Dawn Theatre in the evenings. And thinking about the year preceding the current millennium, something occurred to me – it’s been ten years since Telethon ’77. Telethon ’77 (“Telethon”) was the musical produced in 1999 by Mount Alvernia (the girls school) and Padua College (the boys school). Unlike most school productions, each odd year, the show was an original script (even though it used licensed pop songs for the musical numbers) put together by a production team, some of whom were not teachers at the school at all, just friends and former students. Think about Mr. G and how he alternated serious musical / original production. Premise: a 24 hour telethon at a failing community TV station in 1977 Brisbane and how it affected the lives of all the people working there. Thinly veiled parodies of Bert Newton and Don Lane have a bitter falling out then reunite. Other thinly veiled parodies of 70’s celebrities like Jamie Redfern did renditions of 70’s pop hits that were ultimately ruined by the poor production values of the station. It all turns out well in the end, the station is saved and everyone sings a slightly altered “We Are Family”. It would be years later before I realized the satirical premise of the show – a spoof of 70’s disaster movies with B-grade celebrities (hence the title’s allusion to the Airport series). Gags and references to 70’s moments that I didn’t follow at the time, but got them some time later. It suddenly explained why they included “The Morning After” from The Poseidon Adventure, and it wasn’t just because they were singing it on “the morning after”. Golden. What also occurred to me is that, in that ten years, I haven’t been involved in a show that big since. My law revues featured casts of only sixteen, and likewise with the school plays back in high school as well. I looked through the program which I’ve kept with a whole bunch of other school memories and see a cast of 60-70, plus a crew of at least 20. The show ran over two weeks. There was a massively constructed set. It was done in the San Damiano Centre (where all Padua/Mount A musicals have since taken place, I believe) with quite the large crowd of parents and friends every night. To some it may have been just a school musical – and, in hindsight, it probably was – but I remember it being one of the defining things of high school for me. Like the Law Revue years later, Telethon came along at a time when I was in a social and emotional rut, low on confidence and self-esteem. I was opened up to whole new groups of friends, most of which subsisted up until the end of school. Friends that I would do drama productions with, play in concert bands and orchestras with, attend birthday parties, semi-formals, formals with. I remember getting pumped up backstage in a massive circle with everyone as Bohemian Rhapsody blasted over the speakers. It was a head banging countdown to when we went on. I remember there being some strange fascination with Marcia Hines permeating throughout the production crew. I remember the mass exodus every weekend rehearsal at lunchtime for Hungry Jacks down the road. I remember everyone mucking around with the jukebox down there, and one particular person's fascination with Credence Clearwater Revival songs. I remember there being drama over the stage kiss, which, in hindsight, was blown a bit out of proportion. I remember a camel cutout on wheels that was continually redecorated to accommodate the musical number in question. It worked fine for “Istanbul (Not Constantinople)” but surreal in a song about the Titanic (“Down Among The Dead Men”). I remember flinching at having eyeliner and mascara put on by three very patient teachers who were in charge of the stage makeup. I remember having to sing Stevie Wonder’s For Once In My Life, but then having to sing it in a lower register on the night, rather than Stevie’s high register. At the time, I thought it was because the music had changed key, but it was most likely due to a male puberty acceleration over those rehearsal months. I remember crushes. Hookups. Heartbreak. Drama. I remember pinching some of the scores from the Paduan Music Department after it all finished, so I could learn the chords to Howzat, The Morning After and Midnight At The Oasis. I think they’re still sitting on top of my piano. I remember sitting around and playing Time Of Your Life and American Pie. A lot. This is one of my greatest regrets. It was just embarrassing on my part. I remember T-shirts being signed and one of my friends ending everything he wrote with "dot com". I remember three cast parties and my first heavy drinking experiences. Such an impact this show had on me that, for years, I wanted to base a TV comedy around it, until the “high school musical” craze came along, perpetuated by the movies of the same name as well as Summer Heights High. In fact, given the regular "theatrical" plotlines in We Can Be Heroes and SHH, I imagine Chris Lilley had his own similar experiences which affected him. I’ve still seen the occasional person around Chermside that I recognize from the show. I went to uni with a couple of them. I know several moved to Melbourne to follow their dreams. Some have married, some have kids. The glory of Facebook means that from time to time I stumble across a familiar name from those days. I’ll add them - if they accept, awesome; if they don’t, that’s no problem. I have no photos, and I lost my script. I have a VHS copy of the show that I don’t dare watch unless I want to just plain freak myself out. 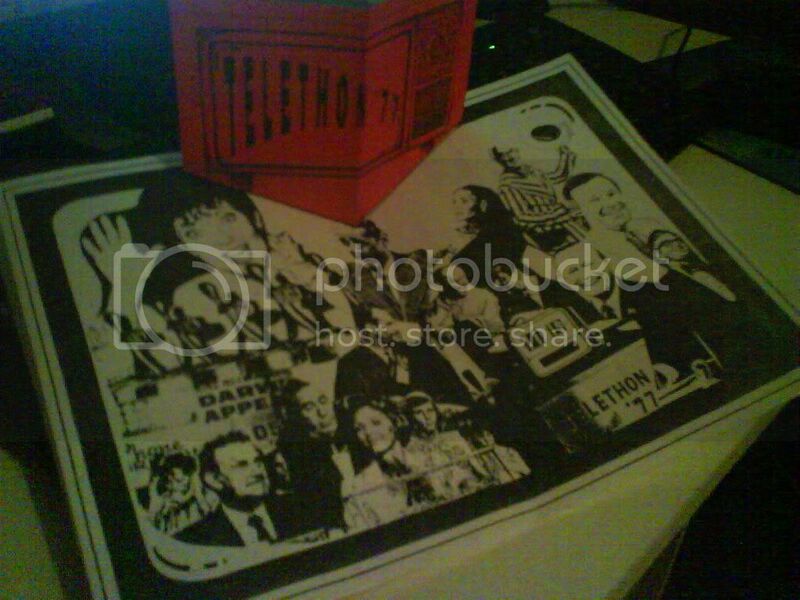 But I thought I’d post a bit about Telethon ’77 on my blog here, because it really did have an effect on my life back then. I’m just stunned to think that ten years have passed and then think about what’s happened since then.